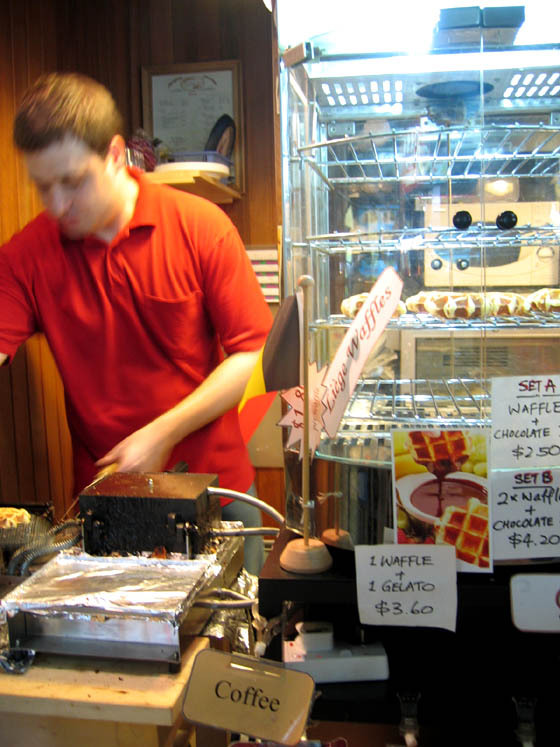 Waffles fall into the type of food category that hardly anyone gets bored of. It carries a smell of nostalgia that most people would love to recall. I’m one of them. 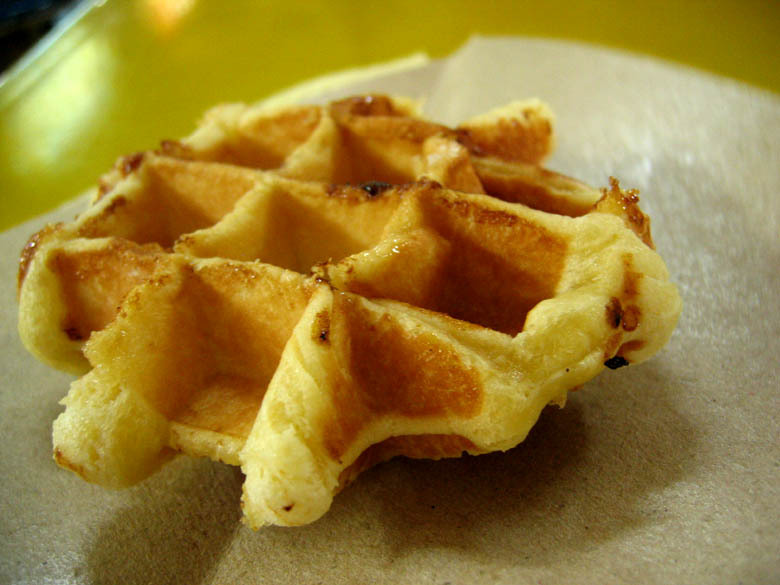 Though in my household, waffles didn’t make a regular appearance, it brings warmth when I think of them hot and fresh out of the waffle iron. I’m like that. I have a thing for smells especially that associated to butter. I think butter is really God’s miracle creation. So anyway, I like waffles and I like them crisp on the outside, chewy on the inside and I think I’ve just found one particular one I really dig. They were featured recently in the Lifestyle section of The Sunday Times. I visited them a while ago but didn’t have time to post about it. But I shall, now. Because I think I have to share my wonderful experience with you! 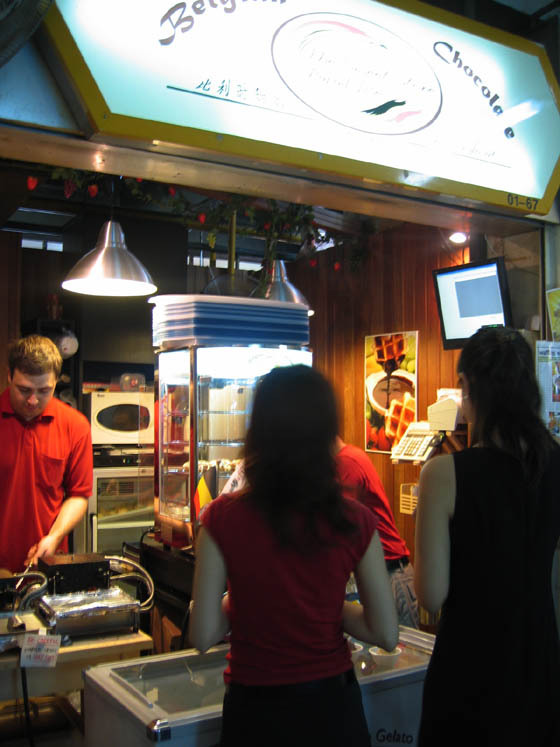 Located at Golden Mile Food Centre at Beach Road, this cosy little stall is tucked in between a Western food stall and another hmm stall which I cannot remember! I think drink stall. Heh. I chanced upon it by accident and I think they’ve only been opened for 3 months. It was phenomenal! I fell in love with their waffles and theirs are the kinds that lingers in your memory even after you’ve left the place. I’d have to be honest and say that their gelato are pretty ordinary. Well I liked the lemon one because it was really citrus-y and sour. Though I heard comments from other customers who had trouble eating it because it was too sour for their tastebuds. Heh. But there was another gelato flavour – Speculoos I think. Yes, I totally loved that. It’s a flavour derived from a spice biscuit. I think it’s German or Dutch. Can’t remember. The store is owned by two gentlemen who decided to be entrepreneurial and just go with this idea and guess what? It worked really well and they now have a loyalty programme. How cool is that? If you love waffles as much as me, please do head down and have a taste for yourself. Opens: 11:30am to 9:30pm, Closed on Mondays and Wednesdays. I like belgium waffles! The last one i had was at a japanese fair at taka. Where they have custard cream or jam as toppings. Woo.. shiok. 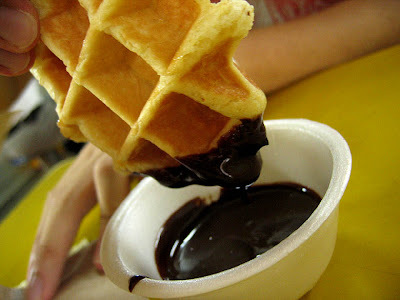 i am imagining waffles with all the holes all stuff with different flavours ice cream, then the whole thingy dipped in chocolate and stuffed into the freezer. it would be great right? you taste peanut butter on one side, then black sesame on another bite. hehe.. 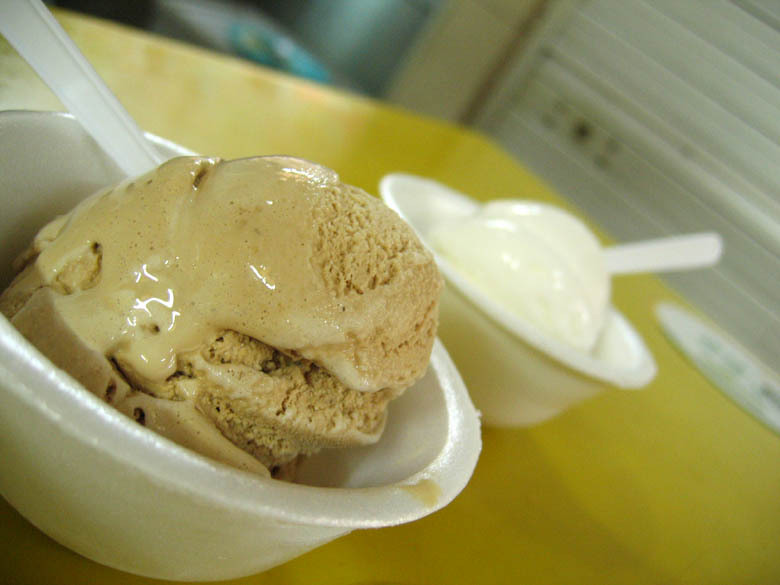 I think I am on an ice cream mood…. we did that in haato the other day. we filled up the waffles with all the diff ice cream flavours. i love waffles…was thinking of trying it out this or next weekend..
btw, i tried the nutella cupcake receipe and I simply love them..
Speculoos is dutch 🙂 It’s basically hard gingerbread. They and the Belgians eat it mostly during the Sinterklaas holiday (St Nick) and the Lotus variety are the best.